David Teh’s new book Thai Art: Currencies of the Contemporary is the first scholarly study of current artistic practices in Thailand since Apinan’s landmark Modern Art in Thailand (1992). But rather than updating that national history, Teh offers a more focused account of the ‘currencies’ Thai artists have generated in their engagements with the international art system. Among these, he charts the fluctuating value of the nation in the interpretation of contemporary art. While a ‘history’ of the latter may seem like a contradiction in terms, contemporary art’s vitality as an economy and a discourse increasingly demands its own historical frame. But should that frame be a national one, or are art’s transnational contexts these days more illuminating? And what has been the impact of regional (Southeast Asian) framing – e.g. by institutions in Japan, Australia and Singapore – on the currency of contemporary art? In Kuala Lumpur, the author will introduce the key concerns of his book, in dialogue with local critic Lee Weng Choy. David Teh is a curator and researcher specialising in Southeast Asian contemporary art. He is also assistant professor in the English Department, National University of Singapore. Before moving to Singapore, he was an independent curator and critic in Bangkok, realising diverse exhibitions including Platform (2006), The More Things Change (5th Bangkok Experimental Film Festival, 2008) and Unreal Asia (55. Internationale Kurzfilmtage Oberhausen, 2009). His recent projects have included Video Vortex #7 (Yogyakarta, 2011), TRANSMISSION (Jim Thompson Art Center, Bangkok, 2014) and Misfits: Pages from a Loose-leaf Modernity (Haus der Kulturen der Welt, Berlin, 2017). Teh has been a co-convenor of numerous symposia including ‘The Animate Image’ (Asia Research Institute, Singapore, 2012), ‘Tradition (Un)Realized’ (ARKO Art Center, Seoul, 2014) and ‘Regions of the Contemporary’ (Afterall / University of Melbourne, 2016). His essays have appeared in Third Text, Afterall, ARTMargins and Theory Culture & Society, and his book, Thai Art: Currencies of the Contemporary was published in 2017 by the MIT Press. He is also a director of Future Perfect, a gallery and project platform in Singapore. 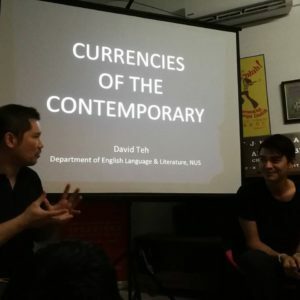 On Wednesday evening, David Teh from NUS presented a talk on Currencies of the Contemporary: Regionalism vs. Bourgeois Nationalism to full house. Local art critic Lee Weng Choy joined in the discussion as a moderator and a respondent. 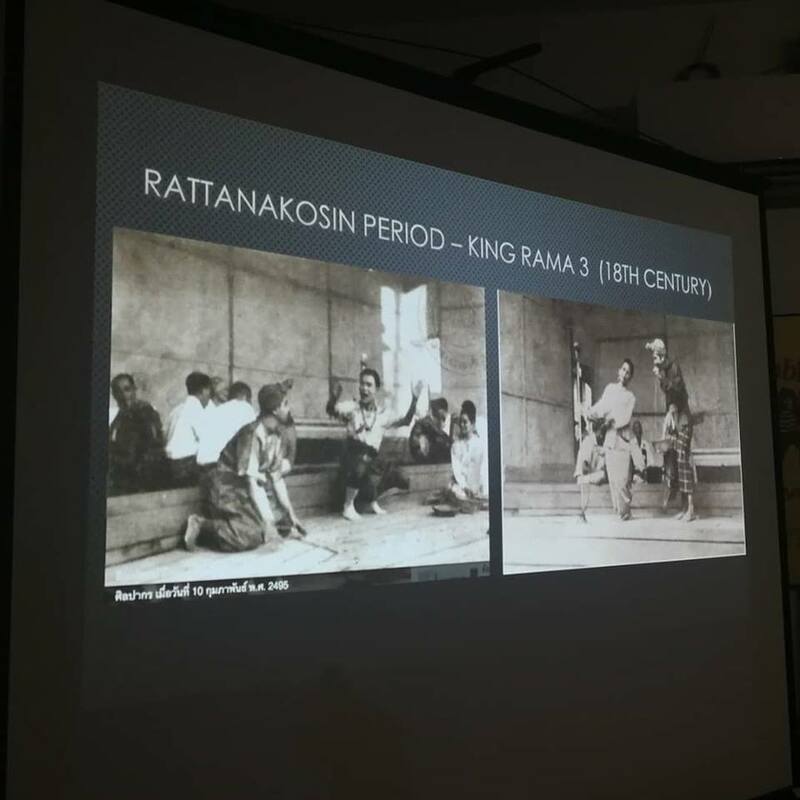 The lively presentation, based on David’s new book, provided us with a brief introduction to Thai modern art history, beginning with the establishment of Silpakorn as an art college by Italian artist Corrado Feroci in the 1930s. Feroci would later take on Thai citizenship and the name Silpa Bhirasri and is revered in Thai art history today. Departing from this central preoccupation with the definition of Thai-ness (khwampenthai) whether in neo-traditional paintings favoured by corporate patrons in the 80s or artists critical of its limitations in the 1990s, a newer generation of artists from the 2000 onwards were seeking for a different visual vocabulary as well as new platforms that provided ‘currencies’. This enabled them to undermine and resist co-optation within a nation-centric art historical discourse. Regional opportunities and alliances created new spaces to stage a form of artistic resistance, or allowed a kind of withdrawal from this increasingly repressive bourgeois public sphere where conversations are narrowly policed by three main institutions of the state – the military, the monarchy and buddhism. 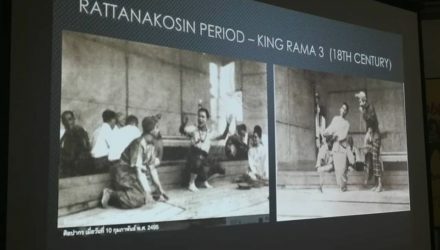 While the nation remains a central concern, many artists like Prachaya Pinthong, Apichatpong Weerasethakul, Araya Radjarearnsook actively decided not to base their artworks on imageries connected to state institutions in order to critical assess the economic, political and social structures that supported the mythologies of the Thai nation-state. Remarkable parallels can be drawn in comparison with the Malaysian context and across Southeast Asia. We even have a small contingent of Kachin refugees who came and sat in rapt attention throughout David’s talk.